Anything else we know about? What non-conference opponents are on your wish list? I hope we can play one of the four NW Pac12 teams, and a couple of Mountain West schools. I'd also love to see a road game in the state of North Carolina for Alec in his senior year. There are 18 DI programs there to choose from. And while we're on the east coast, let's swing up to New York for a game that Jarell's family could attend. I too would love a game in the Carolinas. Please, please, please play the Gamecocks (for my own selfish reasons)! Alec is from the Charlotte area if I recall (which is nearby). SouthCarolinaPilot wrote: I too would love a game in the Carolinas. Please, please, please play the Gamecocks (for my own selfish reasons)! Alec is from the Charlotte area if I recall (which is nearby). I spoke with Alec and Jarrel on Saturday....they told me there are no Pilots games planned for the eastern/southern states this coming season. Alec is really from Arizona, but spent a couple of years in North Carolina when his brother was there.....now that his brother has moved back to California he has no relatives in NC. Not a lot is known about this year's schedule yet, but I've been told the return game at Boise State is still a question mark for some reason. We know UP will play on Thanksgiving Day (11/24) and the next day at Cal St. Fullerton as part of the Wooden Legacy Tournament, and they will then play on Sunday in the Honda Center in Anaheim. The brackets are not yet known, but the schools in the tournament include Cal St. Northridge, Dayton, Nebraska, New Mexico, Texas A&M, UCLA, Virginia Tech, and the Pilots. We know the Colorado Buffaloes will be in the Chiles Center on December 3, and we know the Pilots will play in the Far West Classic at the Moda Center on December 16 and 17 against opponents yet to be announced. Like last year, the UP student-athletes will complete their first semester final exams the same day as the first game in the Far West Classic....so with that in mind, that game should see the debut of Chier Maker in a Pilot uniform. Hey, only four months until the opening tipoff for the 2016-17 regular season when the UC Riverside Highlanders, a member of the Big West, come to the Chiles Center on Veterans Day, November 11th. Last year UCR played WCC opponents very, very tough....losing on the road to LMU and USF by only one point each, and beating SCU at home, 77-63. DoubleDipper wrote: We know UP will play on Thanksgiving Day (11/24) and the next day at Cal St. Fullerton as part of the Wooden Legacy Tournament, and they will then play on Sunday in the Honda Center in Anaheim. The brackets are not yet known, but the schools in the tournament include Cal St. Northridge, Dayton, Nebraska, New Mexico, Texas A&M, UCLA, Virginia Tech, and the Pilots. The brackets have been announced....UP opens up against UCLA on Thanksgiving evening at 8 PM on ESPN2. The pinnacle of the Reveno era. Yes, and then they lost to PSU...kind of epitomized Reveno'so era. mikemac65 wrote: Yes, and then they lost to PSU...kind of epitomized Reveno'so era. Well as I recall it, it was the last day of exam week, and I can't think of a game we ever won that week, regardless of the coach. The next time you see the AD mention that maybe that isn't a good week to schedule games. Ugh, that PSU game. Where we entered the game nationally ranked and allowed the Vikings to shoot something like 65% from 3 point range. I think we then went on the road that weekend and lost to someone like Idaho. Still too scarred to look it up. WCC schedule is out. Pilots open at Pacific on 12/29. Then play Pepperdine at Chiles on 12/31. Then at Santa Clara on 1/5. Zags come to Chiles on 1/7. The traditional travel schedule of two games home or away appears to be blown up, along with the traditional travel partners. Four home games (including GU) without students, ugh! Classes start Jan. 16th. Hopefully many students will come back to campus on Saturday the 14th and come to the LMU game. No pesky library work needed that night, either. Sheesh. Only two Saturday WCC home game during school. Hopefully there will be at least a few Friday/Saturday games in the non-conference slate... those weekend games are pretty crucial for students. And here's hoping the annual Dance of the Decades won't conflict with either of those games... the UP student government has to book the Crystal Ballroom well in advance of the schedule coming out. That can be a real killer for student attendance. Wow. This is a major break from tradition for WCC scheduling. No travel partners. No home/away weekends. No bye-weeks when you play your travel partner/rival. Stonehouse wrote: And here's hoping the annual Dance of the Decades won't conflict with either of those games... the UP student government has to book the Crystal Ballroom well in advance of the schedule coming out. That can be a real killer for student attendance. According to OSU's MBB website, UP will play South Dakota and OSU will go against Long Beach State in a double-header on Friday December 16th, and in a single game on Sunday the 18th, OSU and UP will play each other....all three game are in Portland, but the times and venue are not given. This year, instead of being called the Far West Classic, it is the "Dam City Classic presented by Toyota." Back in 1964 the theme for the Pilots Homecoming Game against OSU in Memorial Coliseum was "Dam the Beavers".......seems appropriate just 52 years later. It also shows the Dam City Classic games on 12/16 and 12/18 will be in the Moda Center, but does not give the game times. 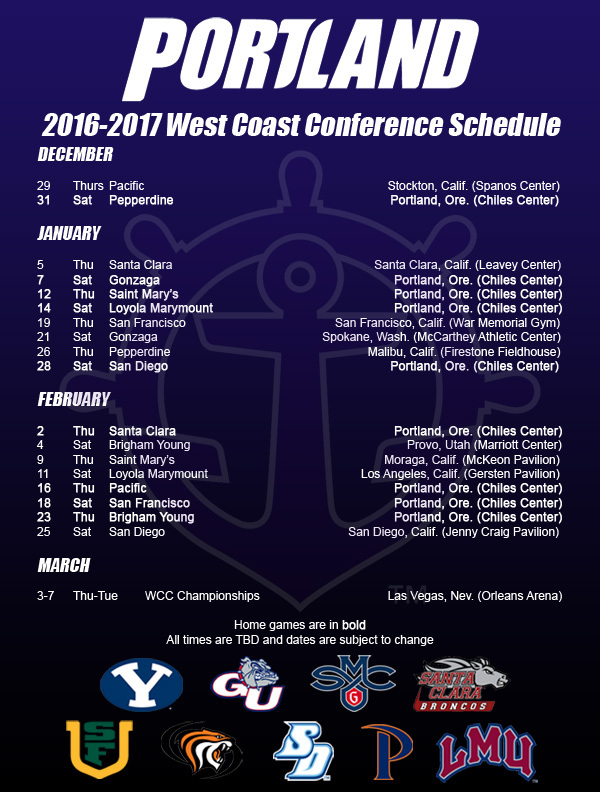 I think the only other addition to what we knew is the expected game at Boise St on 12/10 and the game at Cal State Fullerton on 12/22. Check my math, but I believe that is 7 games in the Chiles Center, 2 in the Moda Center, and 6 on the road in the preseason. Add that to 18 WCC games, 9 of which are at home..... and you get a total of 33 games, 2 of which are exhibition games. When was the last time the Pilots MBB team played 18 games in Portland? So, uhh. Are we going to just say that the Pilots are 0-0 lifetime against UT Rio Grande Valley? DoubleDipper wrote: When was the last time the Pilots MBB team played 18 games in Portland? I'm not sure about 18 games, but the last time we played 19 games in Portland was last year. That's a great non-conference schedule! Especially if we can win one of the first two games in L.A. and avoid playing CSUN in the third game. Looks like we're the only WCC team playing three Pac-12 opponents this year! And we don't have to play any of them at their home arena. Saint Mary's and San Diego have yet to publish their schedules. Dean Murdoch wrote: So, uhh. Are we going to just say that the Pilots are 0-0 lifetime against UT Rio Grande Valley? But you might remember that very discouraging game just before New Year's in 2012 when UP lost to Texas Pan-American. UT Pan-Am was the D1 school that became part of the brand new university system known as UT Rio Grande Valley which went fully operational in 2015 with the inclusion of UT Harlingen. The reason I remember that game is UT Pan-Am threw a defensive blanket over the rest of the Pilots while daring Derrick Rogers to shoot. Derrick "erupted" for 13 points (which included a 3-pointer that caused the players, coaches, and fans to coming flying out of their seats in surprised approval), but the Pilots still lost. UT Pan Am still exists, but its athletics are under the UT Rio Grande Valley umbrella.